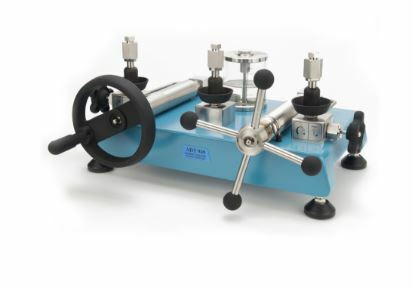 The 949 Hydraulic Ultra-high Pressure Test Pump is a hand operated pressure pump designed to generate pressure up to 40,000 psi (2,800 bar). With the patented screw press technology, high pressures can be easily generated, increased and decreased smoothly. A specially designed shut-off valve makes the pressure as stable as possible during calibration. With no non-returning valve, the 949 avoids the troublesome leakage issues that is usually experienced with hand pumps and allows for minimal maintenance. The 949 is an ideal comparison test pump for calibrating ultra-high pressure measuring instruments such as test gauges, indicators or transducers in the laboratory.